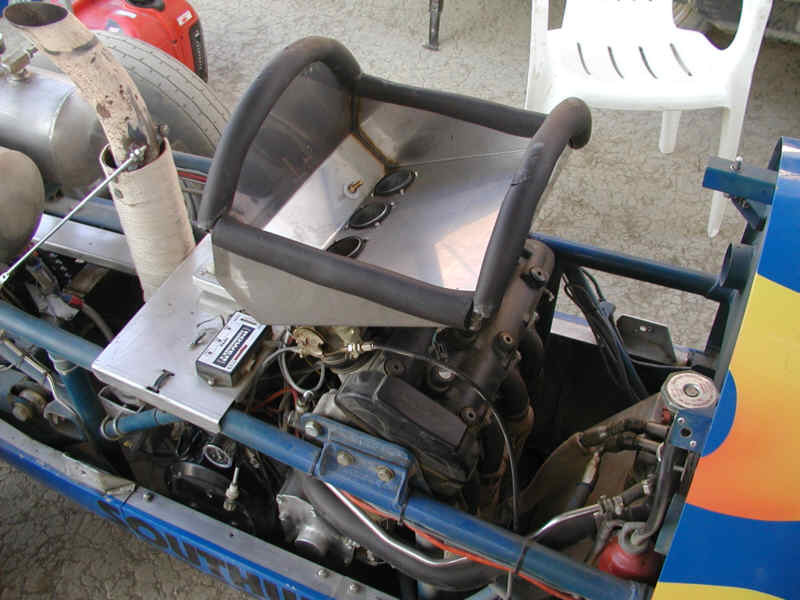 We had the July El Mirage race on Sunday, July 13th, I'm sorry that this is a week late. The large black rubber gasket seals ageist the inside of our motor cowling.On Sunday morning there are 4 lines that the racing teams stage into: the "Even" and "Odd" that split most of the vehicles into two groups based on their standings position, "200 mph" lane for vehicles that can do over 200 mph, and the rookie lane for first time drivers. Since we were 6th over all we jumped into the "Even" lane and left some space in front for numbers 2 & 4. By the start of the race #2 had gone into the "200" lane and #4 didn't show up so we had a clear track in front of us while I was suiting up to run. We were planning the switch back to our motor for the next meet so Mark suggested that this time I "drive it like I stole it" which I did. The track was in awful shape with the whole surface torn up with no smooth spots left to run on. I was being tossed all over the place but I never let up on the throttle even when I was sliding towards the timing equipment. I went through the lights at 177.12 Mph hanging on for dear life. That was not quite as fast as James but he had a better track and a heavy tail wind. We earned 198 points putting us on top of the teams that have only set one record this year and again in 6th place overall going into September. James & I will be going to Bonneville for the Speedweek race in Mid august to do the timing and earn the money that keeps the team racing. 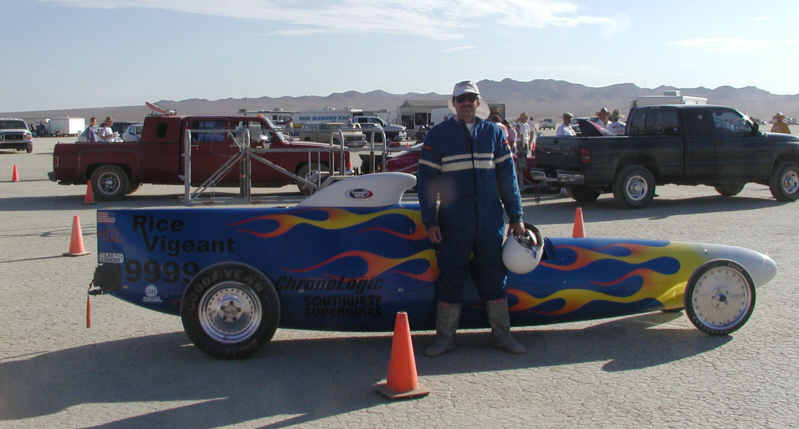 The next newsletter will be in early Sept, just before the next El Mirage race. PS the SCTA's page has a few more pictures of #9999 see the links below.